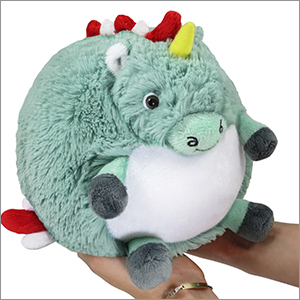 Mini Peppermint Unicorn: An Adorable Fuzzy Plush to Snurfle and Squeeze! Look at this little Unicorn! Just look at him, all filled with holiday joy and and happiness and cuddles! Doesn't he just make you want to...lick his face? Well contain yourself! I know he's the minty-freshest of all unicorns! I know he's filled with elf dreams and the sound of jingle bells, and the smell of fresh snow as it puffs though the pine trees! I know he looks like the shiniest, most magical candy cane you ever crunched...but please, control yourself! Give a Peppermint Unicorn a snuggle! Not a nibble! This Peppermint Unicorn is a Limited Edition design with hand-numbered tags from 1 to 1,000. Once they're gone...they're gone! My little minty wonder is...wonderful! I got him for Christmas and I absolutely love it. I named him Mr. Mint. He's the softest thing I've ever felt! I've had my squishy Peppermint Unicorn since December,(I waited just a bit before reviewing heh heh) and she is still so chubby and perfect, I honestly went through a time period where she went everywhere with me, and I am an adult, she was just such a great little ball of adorable that looking at her de-stressed my entire day! I highly recommend investing in one of these little munchkins! Little Penelope is super fluffy and adorable! I play video games with her curled under my arm and it's a great stress reliever! You just set off a horde? Shoot and scream into the unicorn's majestic mane and you won't feel as bad that your team just got the mess beaten out if them! For puns sake I imagine her theme song being "Penny Lane" by The Beatles. Over all a super squish!